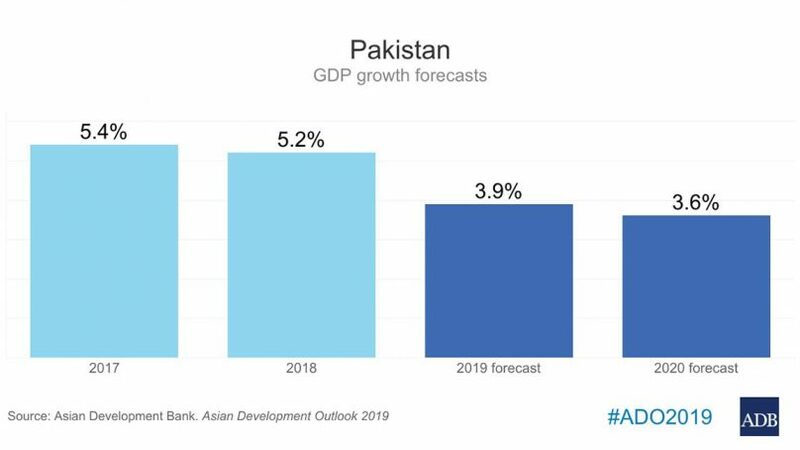 The Asian Development Bank has forecast Pakistan’s economic growth to decelerate to 3.9% in fiscal year 2019 following a pronounced widening of the country’s balance of payments deficit in 2018. “For FY2018, ended 30 June 2018, the estimated GDP growth rate [was] revised downward from earlier 5.8% to 5.2%. Growth therefore slowed from 5.4% a year earlier. The growth decelerated despite revived agriculture. The expansionary fiscal policy markedly widened the budget and current account deficits and drained foreign exchange,” the report observed. “Until macroeconomic imbalances are alleviated, the outlook is for slower growth, higher inflation, pressure on the currency, and heavy external financing needed to maintain even a minimal cushion of foreign exchange reserves. Recurrent crises in the balance of payments require that firms become more export competitive,” it added. 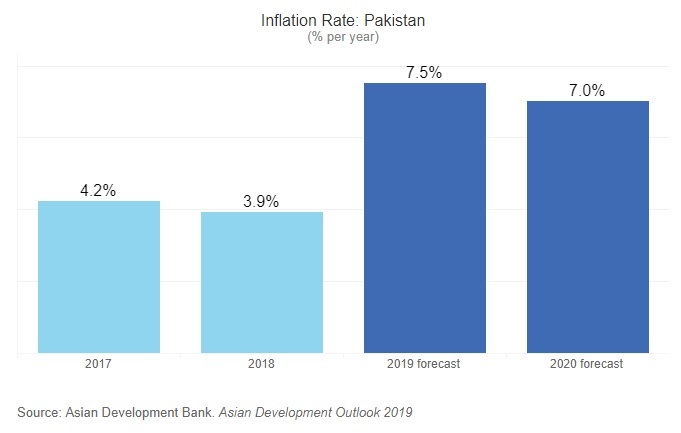 The ADB report said inflation is expected to rise sharply to average 7.5% in FY2019, driven up by continued heavy government borrowing from the central bank, hikes to domestic gas and electricity tariffs, further increases in regulatory duties on luxury imports, and the lagged impact of currency depreciation by more than 10.7% since July 2018. Inflation will remain elevated at 7.0% in FY2020, it added. “The current account deficit is expected to ease in FY2019 but will remain high at the equivalent of 5.0% of GDP because of the large trade deficit. It will narrow further to 3.0% in FY2020 with easing macroeconomic pressures on the external accounts. “Foreign exchange reserves, under pressure, declined by $6.3 billion to $9.9 billion at the end of FY2018, sufficient to finance less than 2 months of imports of goods and services. These external pressures caused the Pakistan rupee to depreciate by 11.7% against the US dollar from December 2017 to the end of June 2018, when the exchange rate was PRs121 per $1,” the report continued. “Growth in tax collection weakened from a robust 16.4% in the first half of FY2018 to only 2.7% a year later. The Federal Board of Revenue targets tax collection equal to only 11.6% of GDP in FY2019, taking into account reduced sales taxes on major petroleum products, drag on the collection of withholding tax from contracts, contraction in general sales tax revenue as imports slow, and the overall slowdown in the economy,” the bank stated. “Lower growth in industry mirrored weaker growth in large-scale manufacturing, which is almost half of the sector, from 5.4% in FY2017 to 5.0%, as well as a slowdown in construction despite a strong revival in mining and quarrying. “Growth in services decelerated from 6.5% in FY2017 to 5.8% last year. Growth in agriculture accelerated, by contrast, from 2.1% in FY2017 to 3.7% on an uptick in minor crops and cotton ginning. On the demand side, growth in private consumption— which provides on average 81% of GDP and was the largest contributor to growth in FY2018—found support in low inflation and interest rates. “Fixed investment in FY2018 reflected higher public investment in infrastructure and energy, especially under the China–Pakistan Economic Corridor (CPEC) project, including electric power projects.